Xenia Sandstrom-McGuire: Destruction is easy - Creation is the Greater Power. Destruction is easy - Creation is the Greater Power. 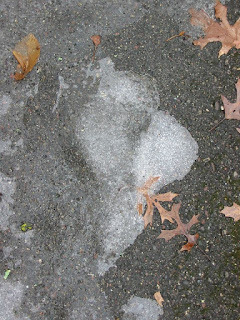 Walking in winter, and in your path there is a place where water had pooled before it froze, leaving a uniquely shaped frozen pocket of air just under the surface ice.Do you impulsively step on it to break it, as one might with "bubble wrap?" - Or do you take some time to admire it. I remember when I stopped stomping on these works of nature, I was in Jr. High, walking to school. And I began contemplating the nature of "Power", "Strength." * Destruction is simple, it is easy, it does not require effort or care or mental planning. Violence and Hatred likewise are easy. They do not demonstrate any show of power or strength. Creation on the other hand is hard, it requires competency, care, and love. My children Soren and Birgitta have often heard me use this story, "Unless you can create something just as beautiful, you have no right to destroy it." Creation is the greater Power. - The image below was taken on a hike at Wild River State Park in March of 2010. Soren looked at it and said, "South America in Ice" - We took the photo so he could share it with his Kindergarten teacher, Mrs. Toso. I don't think we ever did. Krista, the mother of my children and my wife for 26 years was killed by stupidity and weakness. There was no show of strength or power used to destroy her body.